Freecharge in its journey to make wallet ubiquitous in consumer’s daily lives will enable 1,00,000 taxis across India to go cashless with Freecharge wallet. The company has bombarded over 15,000 taxi drivers in Delhi, Mumbai and Bangalore to accept payment using their phone in an easy and secure manner in 60 days. 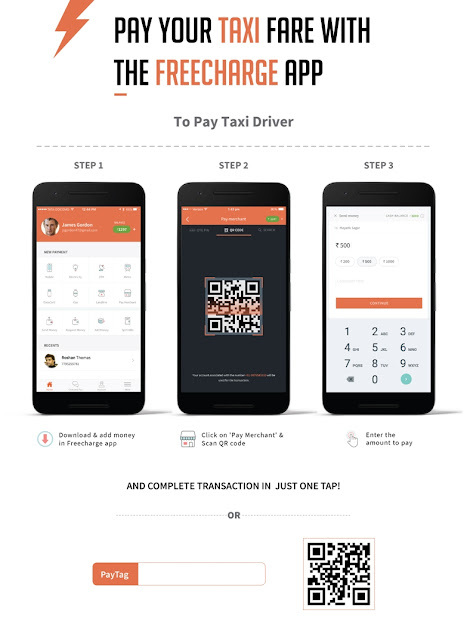 Customers can pay by scanning the QR code unique to individual taxi drivers and complete the transaction in just one tap. Consumers and drivers both find paying and receiving money for daily commute creating friction and leading to not so pleasant experiences. Consumers now will not have to worry about tendering exact change. Freecharge lets consumers pay in less than 10 seconds using their phone and drivers can easily accept the payment digitally leading to seamless and frictionless payment process. Freecharge’s superior user interface and a secure network are allowing drivers to use the app with ease and convenience. Once the payment is done by the customer, the money gets credited to their wallet. The driver can then chose to use the money for bill payments, recharges, transfer the money to their bank account or send money to friends and family using the wallet. With each initiative, Freecharge is contributing to making India a less cash economy.